It’s Saturday morning at the College Squash Association national quarterfinals, and the defending national champion is one game away from ending his collegiate career on a losing note. 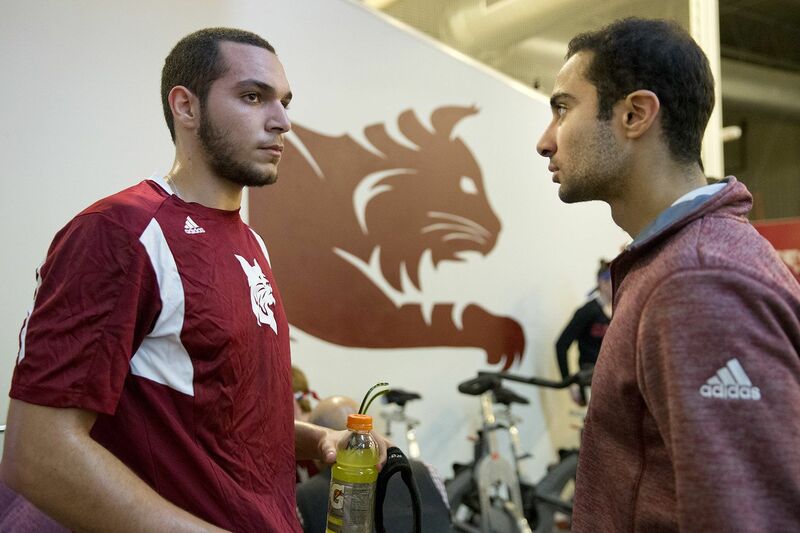 Bates senior Ahmed Abdel Khalek has been sick all week and barely got to do any training. He is nervous. He hasn’t lost a match since his first year. He is looking to become the first collegiate squash player since 2009 to successfully defend an individual national championship. 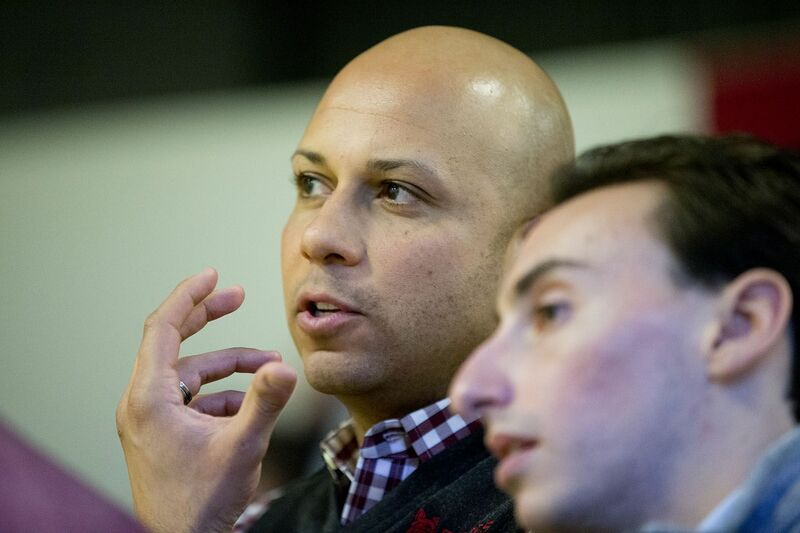 Abdel Khalek has known his opponent, Moustafa Bayoumi of St. Lawrence University, since they were kids in their native Egypt. Now they are facing off in the national quarterfinals in Stamford, Conn., and Bayoumi is up two games to one in the best-of-five contest. Familiar foes, their extended rallies often end with near-collisions, at which point both players turn and look for an interference ruling from the referee. The crowd goes wild over the display of sportsmanship. These rulings are mysterious things for a squash newcomer. For example, early in their match, it appears Abdel Khalek is guilty of interference, but the referee rules that Bayoumi did not make an effort to get to the ball and so awards a point to Abdel Khalek. Bayoumi argues briefly with the referee, who is at least 20 feet up and away from the action. The referee ignores the protest. But then Abdel Khalek tells the referee that he had accidentally stepped on Bayoumi’s foot, and the referee reverses his decision and instructs the players to replay the point. The crowd goes wild over the display of sportsmanship. It might have been the loudest cheer of the day. The players salute each other with a brief pat on the back and resume the match. Abdel Khalek controls the fourth game and wins. Then he dominates the fifth game, showing championship form in an 11-1 victory, securing a spot in the semifinals. It’s his second five-game win over Bayoumi this season. After the match, I’m surprised to see the ousted Bayoumi joining Ahmed Hatata ’17 and Cosquer in Abdel Khalek’s “corner” for the semifinals. It’s like Apollo Creed joining Rocky’s corner in Rocky III, except in this story line, Abdel Khalek is no underdog. “Bayoumi and I played on Team Egypt for six years in a row,” Abdel Khalek explains later. “So I really feel comfortable when he coaches me, because he knows what I’m good at and what I’m bad at. It’s not really about winning and losing when two Egyptians play. Next up for Abdel Khalek in today’s semifinal round is a player from Trinity College. A note on Trinity. Until this year, the Trinity men had advanced to the finals for 20 consecutive years. (Only a 5-4 loss to the University of Rochester in this year’s semis kept the Bantams from their 21st finals.) Starting in 1998, Trinity won 13 consecutive national titles, and won again in 2013 and 2015. This year, the dynasty’s best player is Rick Penders, and he’s to face Abdel Khalek in the semis. But Rick Penders never stands a chance against Abdel Khalek. So far this season, he’s already lost two of two matches to Abdel Khalek, and he loses again today in the semis. After dropping game one, Abdel Khalek plays his best game of the tournament and defeats Penders 11-2 in game two. “That was amazing!” I exclaim. “That’s Ahmed,” Cosquer replies. Abdel Khalek’s mastery of what is known as “the basic game of squash” has never been more evident. When game two ends, I say out loud, “This match is over.” A couple of people look at me, a bit annoyed. He beats Penders 11-5 in game three and 11-7 in game four to end the match. Earlier, after his win over Bayoumi, Abdel Khalek raised his arms to the sky in jubilation. But now, after he beats Penders, Abdel Khalek walks off the court without showing any emotion. “That was amazing!” I exclaim, somewhat stunned by Abdel Khalek’s performance. Sunday arrives. It’s time. The finals. The University of Rochester’s Ryosei Kobayashi is a shot maker, and thus more of a risk taker. When his shots are on, he is nearly unbeatable. But he is prone to making mistakes. Abdel Khalek doesn’t make mistakes. His style is straightforward. He wears you down. He causes you to beat yourself. Last year Abdel Khalek beat Kobayashi 3-0 in the national semifinals in about 25 minutes. But this is different. This is for the national title. 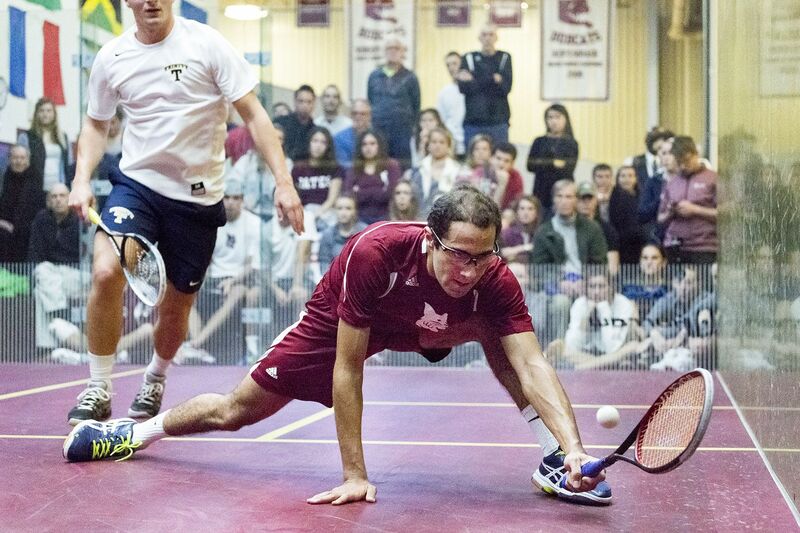 With the players tied one game apiece, the pivotal game three will forever be a part of Bates squash lore. Both players cover every inch of the squash court during their rallies. Kobayashi keeps finding the perfect angle and the perfect spin to put on the ball. The man attacks relentlessly. His style is aggressive and looks exhausting. But it works. Kobayashi piles up points. Abdel Khalek’s knee starts to bleed, and the match is halted. Abdel Khalek said later he didn’t even notice the wound and wasn’t sure how it happened, but the trainer must stop the bleeding or else Abdel Khalek will have to retire. But the crowd is mystified. Who won the point? After 10 minutes, Abdel Khalek is back on the court. Then, on a crucial point, with Kobayashi up 13-12, the players collide and Kobayashi jams a finger while trying to get to the ball. Another injury timeout. But the crowd is mystified. Who won the point? If the referee rules that this collision is a “stroke” — meaning that Abdel Khalek denied Kobayashi a route to the ball — the game is over and Kobayashi wins. When making interference calls, referees often look at whether a player prevents their opponent from reaching the ball. If the officials determine the opponent did their best to get out of the way, they call it a “let,” which means the players re-do the point. “No let” is ruled when the player actually did have a route to the ball but did not get there, and so the result of the point stands. After the injury timeout concludes 15 minutes later, the referees finally make their ruling. The crowd, full of Bates players, parents, and alumni, erupts. Abdel Khalek ends up winning the game 15-13. The fourth game is more extended rallies; Cosquer calls it some of best collegiate squash played in a long time. Abdel Khalek keeps coming after Kobayashi, wearing him down, battling to the wire. Leading 12-11, the steady Abdel Khalek does what he does best: cause his opponent to make a mistake. Kobayashi’s shot goes too low, hitting the “tin” at the base of the front wall. Match over. The individual national championship trophy is coming back to Bates. Abdel Khalek turns to the crowd and raises his arms to the sky, letting out a yell of excitement, and, to my thinking, relief. He shakes hands and hugs Kobayashi, then turns and goes to the front wall, pressing his palms and face against it for 10 seconds. After the frenzied action of the match, it seems more like a full minute. Then he turns and meets Cosquer on the court. He hugs Cosquer. He walks over to team captain Caran Arora ’16 and lifts him up in a bear hug. Then he walks among his many supporters. Squash is not an NCAA sport because not enough schools field varsity teams. It’s not an Olympic sport, either, although that could change in future years. No television network broadcasts the college squash nationals. But the Bates squash family is there. Many of the Bates squash players traveled on their own dime from Lewiston to Stamford for this match to support Abdel Khalek and the other Bates squash players participating at nationals. Abdel Khalek’s immediate relations are back in Egypt. His dad was going to make the trip, but when Abdel Khalek became sick the week before nationals they decided it would be better if his dad stayed home. Still, they talked on the phone after every match over the weekend. With his dad back home, the Bates squash family stepped up as surrogates. 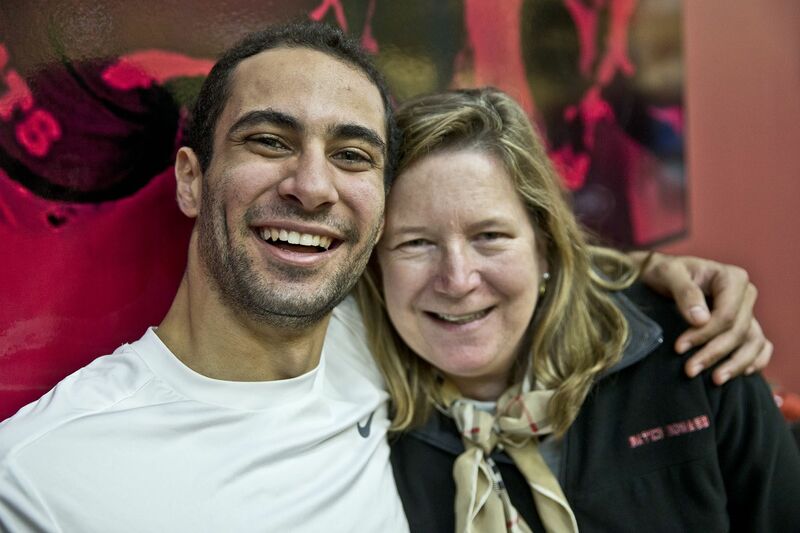 Parents, alums, and current student athletes all made the trip to show their support for Abdel Khalek. 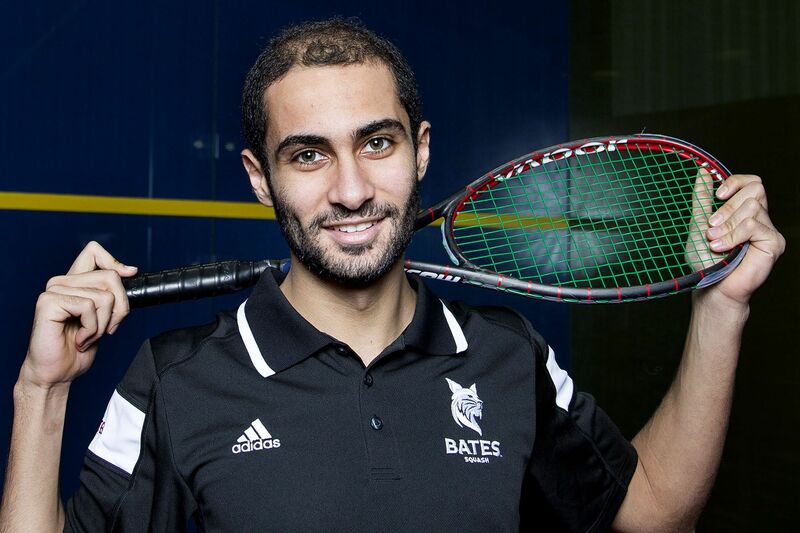 Abdel Khalek, an economics major who has a concentration in income taxation and charitable giving, walks out of the facility as the most decorated squash player in Bates history. 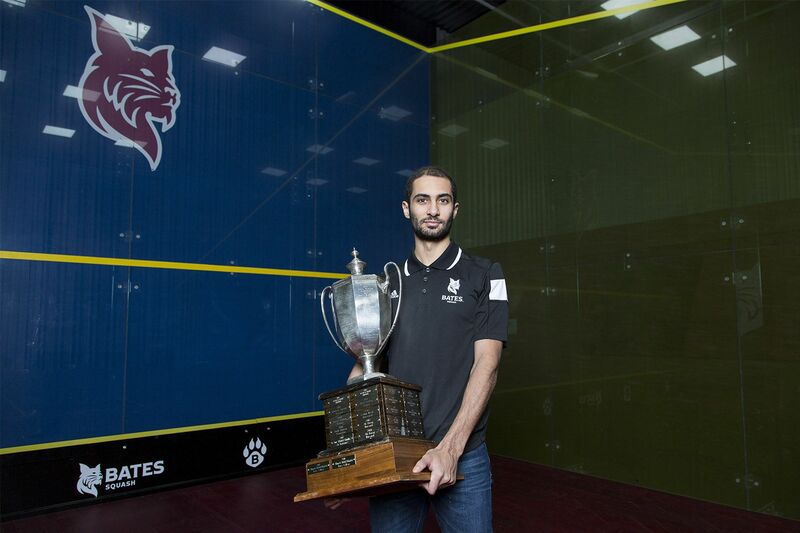 He is the only NESCAC men’s squash student athlete ever to be named conference player of the year four times. He’s a three-time All-American and this year was a finalist for the Skillman Award, the Heisman Trophy of collegiate squash. Abdel Khalek finishes his career on a 66-match winning streak and with an overall record of 89-2. And, now, he is a two-time national champion.